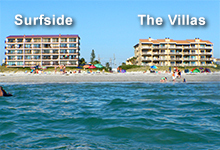 We list and link EVERY lodging provider in Clearwater Beach that we know of. Like this page ?? Visit Beachdirectory.Com for even more detailed information about Clearwater Beach. Parker Manor offers a large heated pool and cozy spa pool, pool table and shuffle board, tiki huts, fishing piers, guest laundry rooms, barbecue grills, hi speed WIFI and more. All units have full kitchens. Deluxe 2 BR / 2 BA units available. Must see pictures of our property! Family-owned and operated. Luxury vacation condos with private balconies overlooking Clearwater Beach and the Gulf of Mexico. A short walk to Restaurants, Shopping, Pier 60, and other activities, yet just far enough away for a peaceful and quiet experience on the beach. Check out our Live Beach Cam! Surf, sun, and sand. Located directly on the Gulfview Blvd, we are across the street from our beachfront sister property Quality Beach Resort, and you may use all the facilities of that property (pool, beach, restaurant). Known for our landscaping, we provides the perfect spot for a memorable vacation getaway. All efficiency suites, with private terraces are graced with either a spectacular pool view or over looking tennis court. Warm and inviting, a calming oasis of lush landscaping and vibrant flower gardens. Relax in our private hot tub! Welcome to beautiful Econo Lodge Beachfront Resort! Soak up the sun on our white sandy beach. Cook up a feast on our barbeque grill by the heated pool. Relax in our private hot tub. All guests must be at least 21yrs old, unless accompanied by there parent or legal guardian. All rooms have free Hish Speed Wireless Internet. Located on 10-acres of powder-white beaches and surrounded by magnificent skies and the beautiful Gulf of Mexico, the Hilton Clearwater Beach Resort is the perfect environment for business or pleasure. We have everything you need to make your stay in Clearwater Beach a relaxing and memorable one. Come experience paradise on Florida's Gulf Coast - Book Online and Save today! Sunsets & Dolphin Sightings are Complimentary! Our waterfront resort is located directly on the Gulf of Mexico, and just steps away from the beautiful white sands of Clearwater Beach. With a 27 million dollar renovation, completed in November 2007, all rooms and suites are completely brand new and feature 32' LCD high definition TV's, granite countertops, and private balconies. Choose your view - the Gulf of Mexico or the Island of Clearwater Beach which offers views of the Intracoastal waterway, canals, and inlets. We offer a variety of room types from standard rooms to one and two bedroom suites. The hotel is smoke free ! Rising out of the azure sea - built in 2010 !! Experience world-class style and amenities just steps from the powder white sands of Clearwater Beach. Balanced between the turquoise waters of the Gulf of Mexico and the picturesque Intracoastal Waterway, Hyatt Regency Clearwater Beach Resort & Spa delivers an idyllic location along with the sophistication, style and comfort of a luxury resort. The newest and only waterfront Hyatt resort on Florida�s west coast, this casually elegant Clearwater hotel and resort is inspired by classic yet contemporary West Indies style. Special Internet rates - BOOK ONLINE! 220 waterfront suites each featuring bedroom with private balcony, bath, living room with double sleeper sofa bed, 2 color TVs with free cable, entertainment center & more. 35 foot cascading waterfall & free-form heated swimming pool. Children�s center with extensive activities program supervised by full-time professional staff. Exactly what you would expect from Marriott. FREE coffee and muffins every morning. We have beautiful views of the Gulf of Mexico. Non-smoking rooms available. 61 rooms, efficiencies and suites. Heated pool, poolside tiki bar where you can enjoy beer or wine, free wifi in public area, in-room phones and color cable TV. Sandpearl complements the spectacular natural beach habitat of Clearwater Beach and Caladesi Island while providing everything you expect from a first class resort, and more. From the casually elegant accommodations to the full service spa, the resort pairs sophistication with down to earth comforts. 253 Guest Rooms and Suites. The Sea Captain Resort on the Bay is located in the center of the island only 150 yards from Clearwater's beautiful public beach. 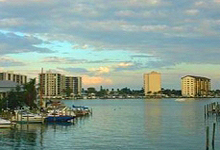 Our private waterfront provides a panoramic view of Clearwater's Marina and Clearwater Bay. The courtyard is complete with a heated pool, spa, shuffleboard court, picnic tables, and grills. Guests can also fish from our dock or, for a nominal fee, use one of our boat slips. Fully equipped two-room suites and deluxe rooms. Located directly on the white sandy beach, we have a heated pool & hot tub. Restaurant features buffets and full service menus. Waterfront tiki bar, a great entertainment complex, including a 2-level night club. Well-being abounds. Discover the romantic flair of our pool garden and enjoy the comfortable atmosphere of our small beach motel, which has a charming style all of its own. We offer clean, quiet rooms and apartments, and a 2-minute walk to the beach. Not only will you find recreation, relaxation and silence, but friendly staff and reliable service to enhance your well-being. More information in English and German on our website. Come and enjoy the Amber Tides experience. 2 and 3 bedroom beach houses - rented out by owner - great rates ! Have your own charming and comfortable Beach House only steps away to our fabulous white sandy beach! Just Relax - no noisy crowds. Beautiful uncrowded beach, walk to Caladesi Island State Park, a natural Florida barrier island. City pool and tennis courts nearby. 10% discount on stays over 7 nights! 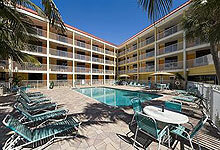 Within walking distance of many of Clearwater Beach's restaurants and attractions. Relax by their heated pool on their newly renovated deck that looks out over the marina, where you can rent jetskis and boats. Close to Pier 60, a playground, restaurants and many stores. Our fishing dock can also be used for docking your boat. We have guest laundry and a sundeck overlooking the intercoastal waterway. 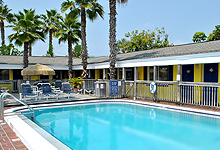 Bay Royal Motel is a family owned and operated business committed to making your stay the best possible. Nestled in the heart of Clearwater Beach, The Award Winning Beachouse is a small non-smoking Inn that specializes in making sure your vacation is exactly that...a vacation. Choices at The Beachouse are endless... stroll the beach at sunset...lounge by the pool/spa...catch the fishing boats as they bring in their catch...climb aboard a pirate ship for a sunset cruise...enjoy all levels of dinning ...or just choose to regroup and do nothing. Directly across from the Beachwalk - great views! Featuring a variety of elegant rooms ranging from basic to beachview. A clean, well-kept facility that has recently been remodeled. Located less than one minute from public access to Clearwater's public south beach. We are located just a few steps from warm white sand and sparkling blue water. Spend a day relaxing by the swimming pool, sunning on our sundeck, or try one of many water sports such as jet skiing, parasailing, and wind surfing. There's always enough time to try your hand at fishing from a pier or on a charter boat. 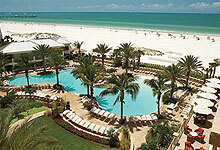 The Camelot Resort is located just 1/2 block from Clearwater's North Beach. Relax in a lush, tropical setting within walking distance to a variety of restaurants and shopping to fit all styles and budgets. We have many features that larger motels don't - private fishing dock, newly painted and remodeled rooms with ceramic tile, guest laundry and a lovely bayside patio on our dock where you can enjoy Florida at its best. See our website for pictures. Certified as a Superior Small Lodging. Heated swimming pool with sundeck and 27-slip marina. ChartHouse features king and queen studios and suites. Most have water views, all have balconies, refrigerators, irons, ironing boards, coffee makers. Must see interior pictures ! We also have a 1875 sq. ft. luxury penthouse. As you leave the mainland, slow down and enjoy the drive across the beautiful palm lined Memorial Causeway to Clearwater Beach. You are entering the relaxing world of powder-white beaches and sun. Your vacation by the Gulf of Mexico may be as casual and unhurried or as active as you choose! Treat yourself to a tropical paradise located on beautiful Clearwater Bay, a few steps to the spectacular powder white sands of Clearwater beach. 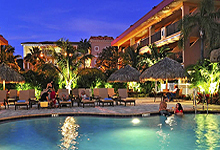 Quaint, friendly resort with unspoiled �Old Florida� charm. Quiet relaxing atmosphere. Watch the dolphins play, bird watch, fish, or just enjoy a romantic warm breeze from our private dock. Air-conditioned, studio, one and two bedroom condos tastefully decorated with all the comforts of home. Poolside bar and refurbished rooms - have a look ! We offer plenty of rooms with direct beachfront views (not partial views). 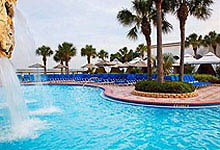 You can also select our Harborside and Cityside rooms and take in the twinkling night lights and the island's scenery. Our poolside bar and a bar/lounge are perfect places to relax and refresh. Our rooms are well appointed in a tropical style decor, and have been refurbished with granite countertops, a vanity cove area, hairdryers, iron and ironing board, coffeemakers, wireless Internet, in-room safes, and of course, sit-in balconies to sit back and enjoy the million dollar views! For your convenience, we also offer an on-site coin laundry. We are AAA approved & certified as a Superior Small Lodging! Stay in the privacy and comfort of our luxury apartment motel while we provide you with all the comforts of home. All units have fully equipped kitchens, full baths, color cable TV and air condition. Large private heated pool with sun deck & patio is here for enjoyment to all of our guests. 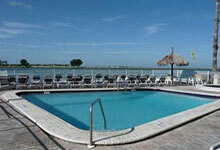 Off the Gulf of Mexico East Shore Resort is located at the waterfront on the Island of Clearwater Beach. It's a 4 minute walk to "THE WHITE SANDY BEACHES". 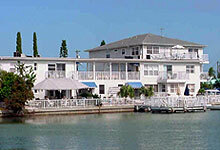 Waterfront resort on the quieter north side of Clearwater Beach. All suites with pool and Bay view, full kitchens, waterfront barbeque area, heated freshwater pool, private fishing pier and more. 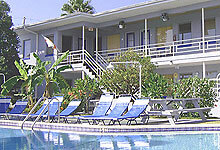 We also offer budget accommodations at The Ibis Apartments, a separate, nearby waterfront location. Owner-operated. Echo Sails Motel & Apts. Charming, well-appointed guest rooms and suites, in an intimate, waterfront setting. We are just minutes walk from the beach, restaurants and shopping. All units feature private terraces and spectacular views! Five Palms Condominium Resort is a two-story property that features 18 condominium units. Every condominium is exceptionally clean and tastefully decorated. 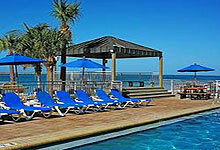 Five Palms Condominium Resort is located on the north end of Clearwater Beach on Clearwater Bay. We are located two blocks from the beach and close to all the shopping, restaurants, and activities in the area. 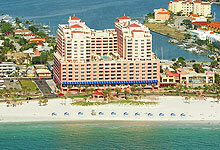 The Palm Pavilion Inn on Clearwater Beach is proudly located on one of the top ten beaches in the country!! Our quaint 29-room Inn features hotel rooms, efficiencies and one-bedroom apartments. All of our rooms are non-smoking and offer wall-to-wall carpeting, individually controlled room air-conditioning, wall mounted hairdryers in the bathroom, refrigerator, remote control color television with HBO, in-room safes at no extra charge and electronic door locks for safety. Quality Hotel is located DIRECTLY on the beach! All their spacious rooms feature either a private balcony or patio. Multiple year recipient of the TripAdvisor Certificate of Excellence. Also recipient of the Choice Gold Award for upholding and exceeding service and hospitality standards. An affordable way to stay on the beach, not near it! All Rooms: Microwave, Mini-Fridge, Coffee Maker, Hair Dryer, Flat Panel HDTV's, Granite Counter Tops, Free Local Calling, and More! Tired of arriving at your destination and being disappointed with your room? Not here! Our fully remodeled property decorated by Dale Everett Designs has beautiful granite and wood kitchen and tile throughout. The rooms rival four-star properties'! You�ll never stay anywhere else again! Our southern exposure offers many hours of sunshine at our heated pool. Our great central location means your can walk to all area attractions. Internet discounts up to 40% off during the months of Nov. and Dec. New owners, all units recently remodeled and fully equipped. Fitness and tennis center - a true resort ! Adjacent to Sand Key Park and Preserve and across the channel from bustling Clearwater Beach, Sheraton Sand Key Resort is ideally nestled on 10 acres of one of America's top-rated beaches. All 390 guest rooms and suites are spacious and include a private balcony. The resort is equipped with a fitness center, lighted tennis courts, water sport activities and rentals, summer kid�s camp and much more. Walking distance to food and family fun. The Silver Sands Motel is just a few steps away from beautiful Clearwater Beach on the Gulf of Mexico, walking distance to Clearwater attractions. Experience the sunshine, ocean breeze, and a stroll along the waterfront like you never have before. 6 unit, family owned crisp & clean apartments - 82 steps to the beach! The Snowflake Inn is 82 steps away from the beautiful white sand of Clearwater Beach. We welcome those who are Snowbirds and any Snowflakes (those who drop into Florida but have not made a commitment to stay for a long time yet). Steps from the Gulf of Mexico and the Palm Pavilion, a block from the Rockaway Grill, 1 1/2 blocks from tennis & swimming pool, 4 blocks from Pier 60 and a straight ride on Route 60 from Tampa Airport or St. Petersburg / Clearwater International Airport. 12-unit motel with the best hospitality !! Sta 'n Pla is located on Clearwater Beach, just two short blocks to the sparkling white sand bathing beach on the Gulf of Mexico. We have a private dock for fishing and boat mooring. Within walking distance are fine restaurants, shopping, deep-sea fishing boats, Civic Center, library, bank, post office, and nighttime entertainment. 7th night free - Pool, covered parking and more! This family operated motel has studios, efficiencies and apartments. All units have fully equipped kitchens, color cable TV, heat and air conditioning. 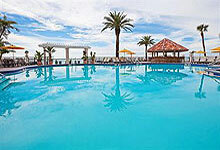 Relax in their lush tropical garden by the pool, or take a short walk and lounge on the sands of Clearwater Beach. Bayside location just 100 yards from beach! Fish off our private dock or enjoy a swim in our large heated pool. All units are super clean, have fully furnished kitchens & daily maid service. Shuffleboard, BBQ and picnic area on site. Family-owned traditional motel - great rates! Newly renovated motel features cable TV, individual heat/air, heated swimming pool with southern exposure, and fine restaurants and shopping centers within easy reach. Beachdirectory.Com - a detailed Florida Gulf Coast website. Ellenton - the best outlet mall in the state. Located just east of Bradenton along I-75. Oldsmar - named after Ransom E. Olds, auto pioneer and founder of both the Oldsmobile and REO brands. Thanks to wise city government, this city has weathered the financial crisis very well while maintaining a new and fresh look. Eureka Springs, AR - a beautiful Victorian village in Northwest Arkansas. Holiday Island, Arkansas - just a short drive from Eureka Springs. Hattiesburg, Mississippi - home of Southern Miss University, this unique metro area of about 100,000 people is regularly ranked as one of the top 50 small towns in America. Visit to find out why, and be sure to visit the unique Keg & Barrel brew pub. Learn about Southern Prohibition, which started well before nationwide prohibition.